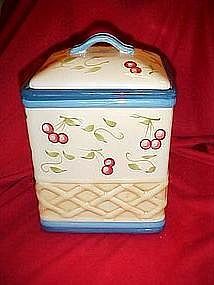 Large cookie jar measures 10 1/2" tall and has a basket weave pattern at the bottom with bunches of cherries decorating the upper half with two tone blue trims. Made of glazed ceramic by Inspirado. I actually have four of these. The consignor used them as cannisters. They are all the same size, and all are in pristine condition. They have the gasket on the lid for freshness. Price is for each cookie jar.